CD sales in Japan remain strong despite digital alternatives. Devoted CD buyers aren't a dying species. At least not in Japan. While nearly every other country seems to be gradually giving up on CDs, the Japanese remain devoted to the compact disc. The Japanese spent more money on CDs in 2012 than consumers in any other country, according to figures from the Recording Industry Association of Japan. CD sales actually grew 9% over the year before. Physical media including CDs and DVDs made up 80% of all music sales by value in 2012, compared to just 34% in the United States. But why? For a country that is home to pioneering tech brands like Sony (SNE), Panasonic and Nintendo (NTDOF), the attachment to physical music seems a bit odd. Culture plays a big role, according to Kotarao Taguchi, managing director of the Recording Industry Association of Japan. He said that Japanese customers don't just want the music. They also want the liner notes, the cover art and DVD extras. "I think Japanese people as a nation have a strong attachment to physical goods," he said. Bands in Japan have learned to cater to this phenomenon, releasing more expensive, limited edition discs with more elaborate artwork and special inserts. "In Japan, people have a tendency to doubt the quality of products when they are too cheap. They care more about whether it has an official jacket on the CD," said Taguchi. 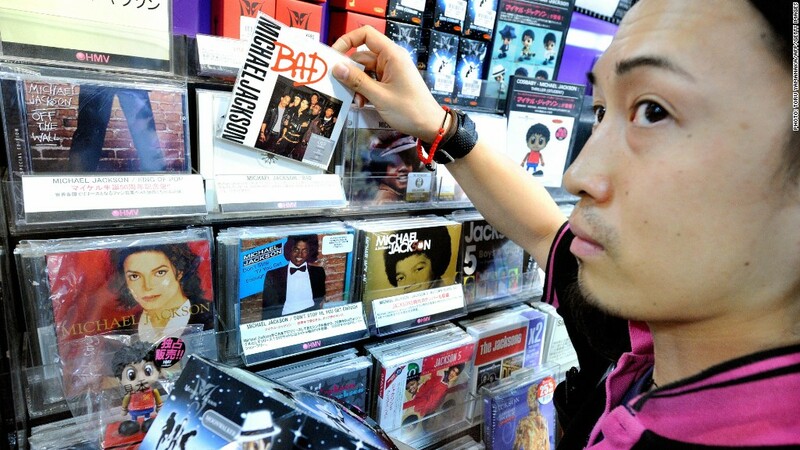 Intense fan loyalty, a pillar of the Japanese music industry, has also fueled CD buying. For example, local bands release special CD singles that come with free tickets to meet and greet events with the artists. At a recent performance by Baby Raids, a J-pop group composed of 13 to 18-year-old girls, devoted fans lined up to buy copies of the available CD single. Priced at $10 to $16, each disc came with a ticket for a "shaking hands" event after the show. One fan bought 20. Japan also has a rapidly aging population and sellers says older customers are more likely to buy the physical format they've been playing for decades. "Especially customers who are in their late 30s or older who grew up in the packaged music era, they have the tendency to buy CDs," said Tatsuya Murakoshi, a manager at the Tower Records in Tokyo's Shibuya neighborhood. Japan's strong CD sales are good news for the music industry, which makes more money from the sale of a CD than a digital download. As sales in other countries have declined, Japanese buyers have provided something of a buffer. But even in Japan, the good times may not last forever. CD sales are weaker this year, and industry experts say digital sales may get a boost with streaming services like Spotify looking to enter the market. Murakoshi, for one, believes his customers won't completely abandon their discs. "I don't think CD sales will ever die out," he said. -- CNN's Yoko Wakatsuki, Junko Ogura and Saori Ibuki contributed reporting.